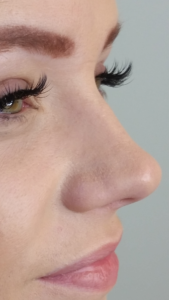 Eyelash extensions are one of today’s biggest beauty trends. They have a natural look and feel and are easy to maintain. 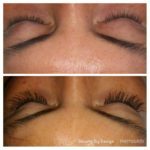 Eyelash extensions provide instant gratification! This service is very relaxing, most clients fall asleep during the procedure. 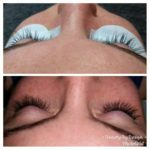 Eyelash extensions are applied to individual lashes, one lash at a time to give a natural yet elegantly enhanced appearance, without applying mascara! If you use waterproof mascara, avoid using it 2-3 days before your service. Arrive to your appointment with clean, dry, makeup free lashes. Remove contact lenses before your appointment and avoid caffeine for a minimum of 4 hours prior to your appointment. Your first visit will be the longest. A full set takes approximately 2 hours, but before we get started there is paperwork to fill out and discussions to have; I like to allow 20 minutes for this. We will discuss the look that you want to achieve and answer any additional questions that you might have. Before we begin the procedure you will be asked to silence you phone and put it away, you will also be asked to take off your shoes; the facial bed will have fresh sheets on it so that you can lie back, cover up, and relax. 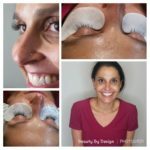 Your lower lashes may be taped down, special gel patches will be applied, these patches provide a premium hydrating treatment. 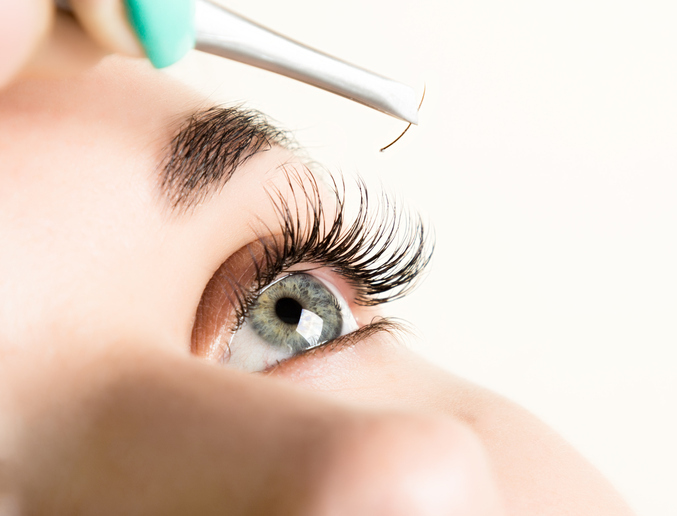 Then, using medical grade adhesives and tweezers the lash extensions will be applied one by one, one lash at a time. This is called classic eye lash extensions and is what I specialize in. Which eyelash extension product do you use? 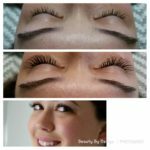 Yvonne is a Certified Lavish Lashes Professional and works with both Lavish Lashes and Bella Lashes they are semi-permanent professional quality synthetic lashes. They feel natural and have a natural looking curve, so no need to use an eyelash curler. These Lashes come in various lengths, colors, and thicknesses to create a beautiful and natural look. 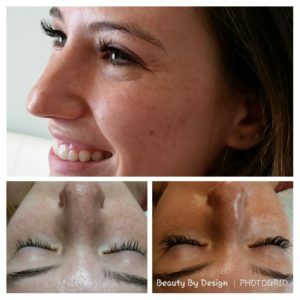 Eyelash extensions are not affected by normal showering, swimming, or trips to the spa, once they have cured for the first 24 hours after application. 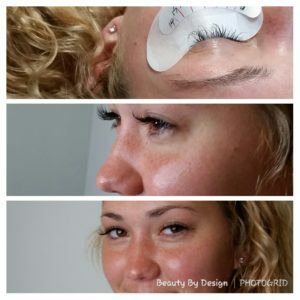 Eyelash extensions fall out with the natural lash that it is adhered to or at the end of the glue bonding time. 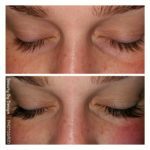 Each eye sheds approximately 2-5 lashes every day, on average about 3 lashes are shed each day. 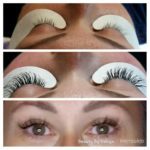 Therefore in 1 week you will lose about 21 lashes, 2 weeks 42 lashes and so on. Bonding time of the glue is 5-6 weeks. 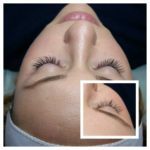 How often do you need an eyelash extension fill-in? Fill-in appointments are recommended every 1-3 weeks. And I highly recommend that you purchase and use an eyelash extension cleanser and sealant; this will give longevity to your eyelash extensions! What about a patch test? 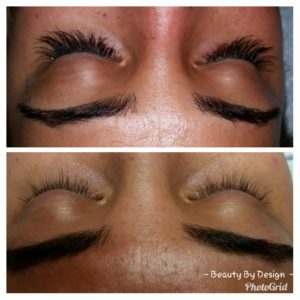 You can request a patch test to be performed (a few lash extensions will be applied to each eye), you will go home and if no reactions occur you will come back in for your already scheduled eyelash extension appointment. If you decline the patch test we will proceed with the service. 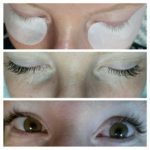 During the service you will lie back, special eye gel pads will be applied under your eyes and your lower lashes may be taped down. 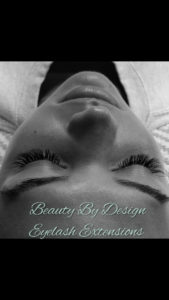 Then using medical grade adhesive and tweezers the lash extensions will be applied one-by-one. 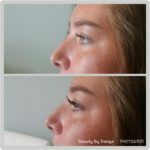 Who is not a good candidate for eyelash extensions? You are not a good candidate if you have recently undergone or are currently undergoing chemotherapy. Also, anyone who has alopecia suffers from Trichotillomania or Trichosis, or any eye condition where the eye doesn’t look healthy, or if you have an adhesive or latex allergy. Also, if your have very oily skin; oil breaks the bond of the adhesive. 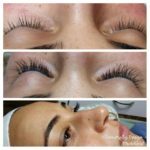 Who is a good candidate for eyelash extensions? 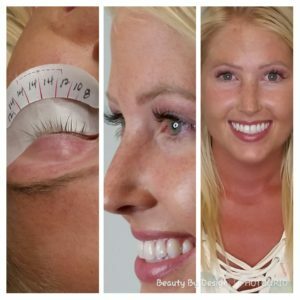 Anyone who desires fuller, thicker, longer lashes without the hassle of using mascara or store brand false lashes. Call 910-399-8799 Ext. 1 to reach Yvonne, or click the schedule now button and schedule your service today! Copyright 2019. Beauty by Design. All Right Reserved.